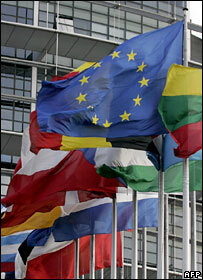 The European Parliament has approved a 50.5bn euro (£33.5bn) plan to boost science research in Europe. Framework Programme 7 (FP7) is designed to support several priority areas of research. Of the different research categories, information technology gets the biggest chunk of funding, with a 9.1bn euro (£6bn) budget. But research into climate change and energy has received a comparatively small amount of funding in the plan. The Parliament gave the go-ahead to the plan on Thursday at its second reading. FP7 is due to be formally adopted by the EU on 5 December. The programme is due to run from 2007 to 2013. Speaking at a press conference to announce the agreement, Janez Potocnik, commissioner for science and research at the European Commission, said it was "a great day". He said: "In financial terms, this is a major improvement over the last framework programme. In real terms, there are 40% more funds on average per year." FP7 will contribute to fulfilling the reforms laid out in the "Lisbon strategy", which aims to make Europe the "most competitive and dynamic knowledge-based economy in the world". Another objective in the strategy was to boost Europe's research and development spend to 3% of GDP by 2010. But observers say Europe now looks set to miss this objective. Peter Cotgreave, director of the UK Campaign for Science and Engineering (Case), writes on the BBC News website: "At about 7 billion Euros annually, Framework 7 represents about three-quarters of one percent of the EU's national product, as far away from the Lisbon target as Helsinki is from Valletta. He continued: "This is frankly unrealistic within the timescale of the Lisbon agenda. It means that within just over three years, the EU countries are going to find another 118bn euros a year for research, enough for every man, woman and child in the EU to fly backwards and forwards from London to Athens twice." Commissioner Potocnik recognised that boosting Europe's spend on R&D was vital: "If we compare ourselves to our major competitors of today, we are lagging behind. If we compare ourselves to the major competitors of tomorrow, we are lagging behind. What we are seeing in Asia, especially China, is incredible." But he pointed out that FP7 could not make or break the 3% spend on R&D. When the Lisbon strategy was drawn up, it was agreed that public spending would contribute one third of the 3% figure, with the other two-thirds coming from the private sector. 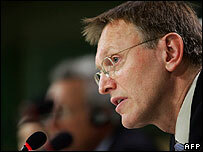 The framework programmes comprised about 6-7% of public spending across Europe, said Commissioner Potocnik. FP7 is set into five parts including the "co-operation" programme which lays out funding for specific research areas. Information and communication technology (ICT) is the biggest winner, followed by health (6bn euros), transport (4bn euros) and nanotechnology (3bn euros). Antonia Mochan, spokesperson for science and research at the European Commission, told BBC News: "ICT tends to be an area where you can invest and get a lot back. It is also an enabling technology. A breakthrough in ICT can have all sorts of impacts across all sorts of areas. Commissioner Potocnik said it was a "great day"
"Miniaturising a [computer] chip for example, or making it as bendy as paper, can apply across a whole range of different industrial sectors. So its potential is that much greater than in some other areas." But the money available for energy and environmental research is comparatively small. Energy research will receive a 2bn-euro budget and environmental research will receive 1.8bn euros. However, Ms Mochan said individual scientific projects could receive funding from different parts of the cooperation programme. Scientists have warned that Europe faces a "brain drain" if it does not make good on promises to boost its knowledge-based economy and becomes a more attractive place to carry out research.